I am so happy that my One Room Challenge is now complete and ready to reveal to you all! Truth be told, this one seemed a bit easier than my first, but it still took a lot of work to make this happen in six weeks. First, a quick reminder of the process that we follow. 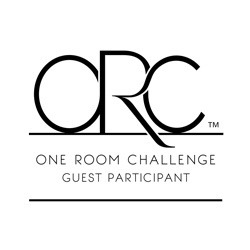 The One Room Challenge is a six week event hosted by Linda of Calling It Home and her media partner, House Beautiful. Participating bloggers select a room to make-over within their respective homes. Each week, the progress of the make-over is revealed. Today, all of this comes to a culmination with The Final Reveal. You can just feel the excitement! I hope you’ve been following along, but if you need to catch up you can do so below. After all of my planning and work, this is my new guest room! Doing this project has truly has been a labor of love. I have had many guest rooms over the years, but I’ve never had two that were complete and as welcoming as this one and the one I designed last fall. 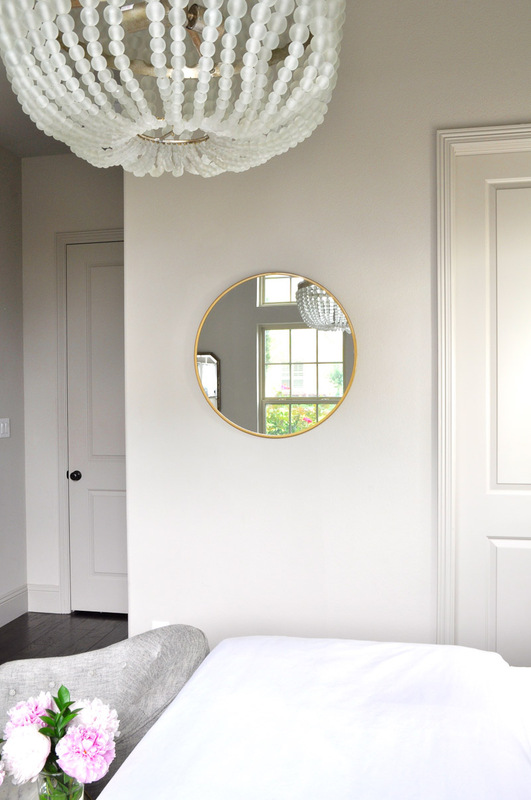 When we were building our home some four years ago, I selected almost all of my furnishings, lighting, and bedding from five of my favorite brands. Fast forward a few years later and I feel very blessed to be working with four of them on this room reveal. It is a perk of blogging that I could never have imagined back then. But, it was all part of my journey which led to this passion of mine, design blogging. And now, for the details….. The chandelier by Currey & Company is so stunning in person. I have a couple of furniture pieces by this favorite brand, but this is my first chandelier and it’s exquisite. The frosted glass beads are graduated in size and they are a beautiful contrast to the champagne-colored frame. The overall shape and size fits the scale of the space, which is very important in a well-designed room. The most wonderful thing about using a statement fixture like this one, it draws your eyes up to the best feature of this room, the cathedral ceiling. Another brand which is special to me is Aidan Gray. I have loved them from the moment I first saw their beautiful pieces. When shopping for this room, I found these chairs and knew they would be the perfect choice. Their unique shape provide visual interest. Moreover, the slightly more masculine fabric offers a little contrast to the white bedding. Like your taste, mine changes over time too and I am thrilled to be sharing a bit of that in here today. 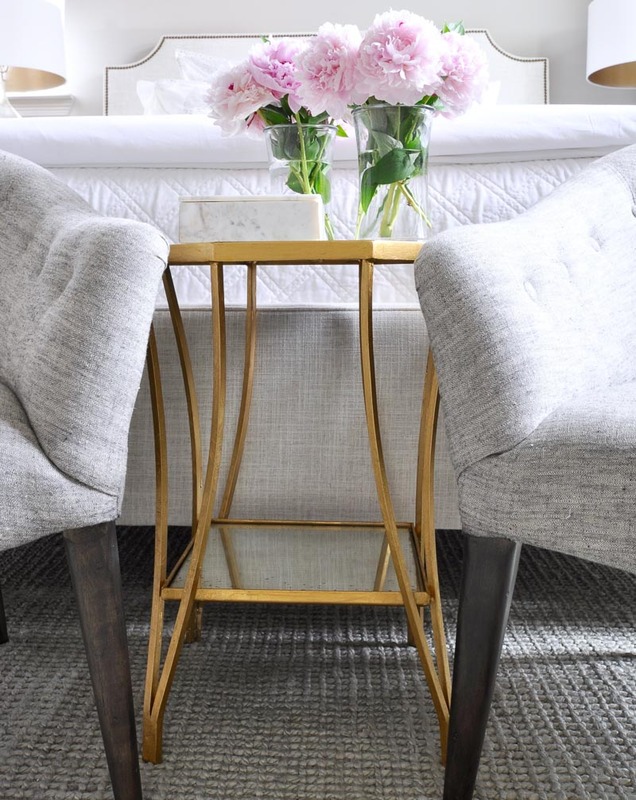 The gold drink table, also by Aidan Gray fits perfectly here and helps provide interest beyond the typical bench at the foot of the bed. 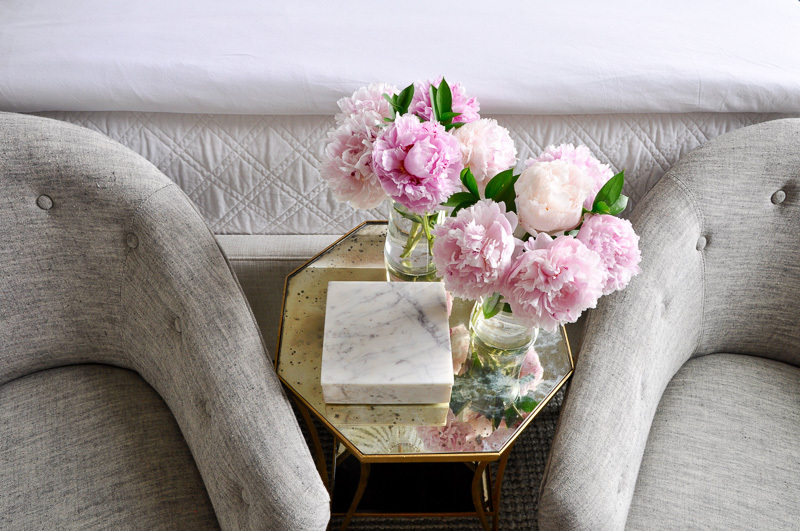 Don’t get me wrong, I love a pretty bedroom bench. But, I definitely wanted this room to have something unique and the chairs and table fulfilled that wish. 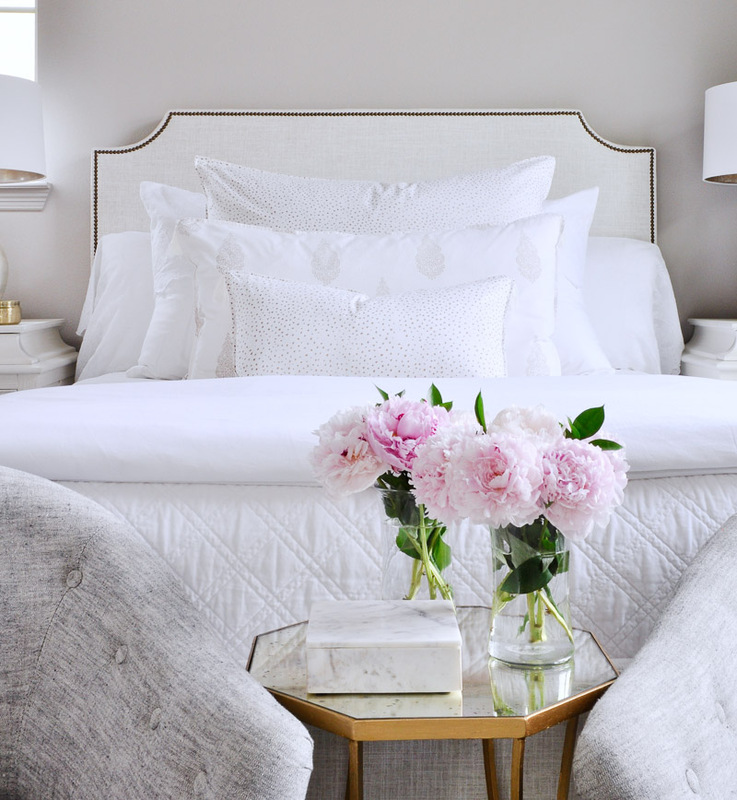 The bed is upholstered in a beautiful neutral linen. I’ve used a similar sand colored linen in most of the other rooms in my home, so it helps with the flow. You can read about this and my other tips for decorating an open concept home here. I fell in love with the nightstand details the second I found them. They are even more special in person. The painted finish is textured which adds additional intrigue. Also, they have large drawers which are perfect for storage. The nightstands and the bed were actually the first items I ordered. They are both by Gabby and like all of my pieces from this beloved brand, they are of excellent quality. Gabby is a division of Summer Classics and I adore working with both as a StyleMaker. You may recall my recent Patio Update Reveal in which I featured some beautiful new outdoor pieces. Another brand that I was a loyalist to prior to launching this blog is Pom Pom at Home. 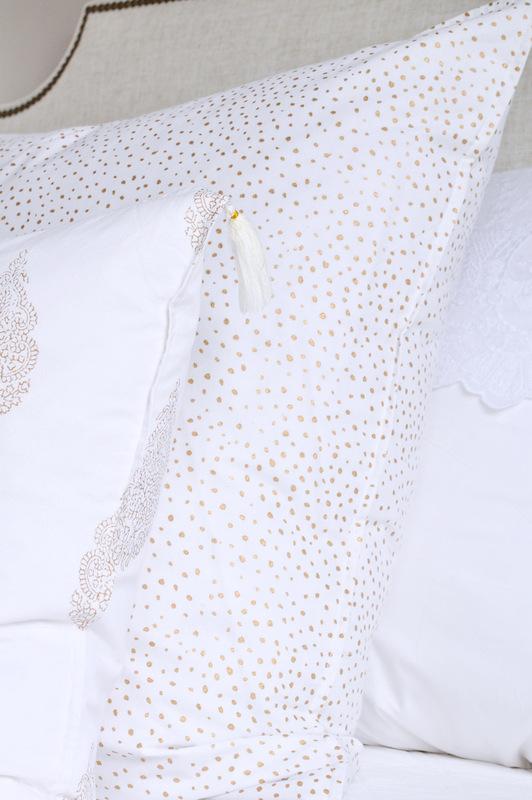 They’ve done it again and this bedding is beyond exquisite. Below, I selected hand blocked pillows which are made using a century old Indian art form called hand blocked printing. The pattern is created by dipping hand carved wooden blocks into dye and then stamping them by hand onto the cotton fabric. I chose a medium and large lumbar size as well as a big pillow. They are perfect for the full bed reveal. 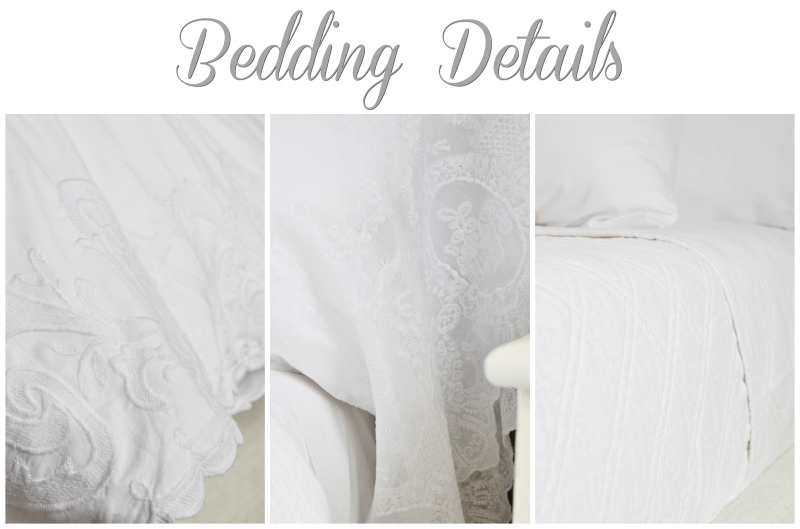 Aside from the gold design on the hand blocked pillows, I chose all white bedding and focused on texture and details. The duvet, euros, and pillowcases are all from a new collection which features subtle embroidered details on stonewashed cotton. I also used a cotton velvet coverlet and a cotton percale sheet set. All are so pretty and timeless! Underneath the lovely bedding is an incredible Bamboo Mattress by Cariloha. This was my first time using a bamboo memory foam mattress and I must say, it’s incredibly comfortable. The charcoal bamboo is naturally breathable which allows you to remain cooler while you sleep. I recently selected some additional bamboo products in an effort to get my home more guest ready. My loyalties are quickly building for this company! By the way, a 9″ Box Spring is completely hidden, which elevated the mattress to the correct level. The 20″ down inserts are from Joss & Main. I also found the Euro inserts there as well. They are made to order, but still very reasonable in price. Additionally, I chose queen pillows and king pillows for the comfort of our future guests. I chose all of these based on the reviews which are top-notch. Reflecting on all components of this room, the rug has been my greatest challenge on this journey towards the reveal. That and the fact that we snuck away to Charleston for four days the last week before the reveal! But, back to the rug. I have two and absolutely I love them both. The gray one was originally meant to be the bottom layer and I was going to put a patterned one on top. Well, the patterned one I had hoped to add didn’t work out. I will be thrilled if I get the chance to add it later. I should mention that Jaipur Living was so generous to send two. I’m very grateful. Each of these oversized rugs is beautiful and the quality is excellent. As I mentioned last week, I haven’t been able to make them work together, but I am going to share the room with the other one in an upcoming post so you can see how something as simple as changing a rug can provide an entirely different look! For purchase information on the rugs, Tobago Natural and Heron (which you can see here in my Week 5 update), please contact Jaipur Living at info@jaipurliving.com and they will help you find the nearest retailer. Now, let’s get to the accessories. I found this beautiful marble box. It works harmoniously with the gray chairs. 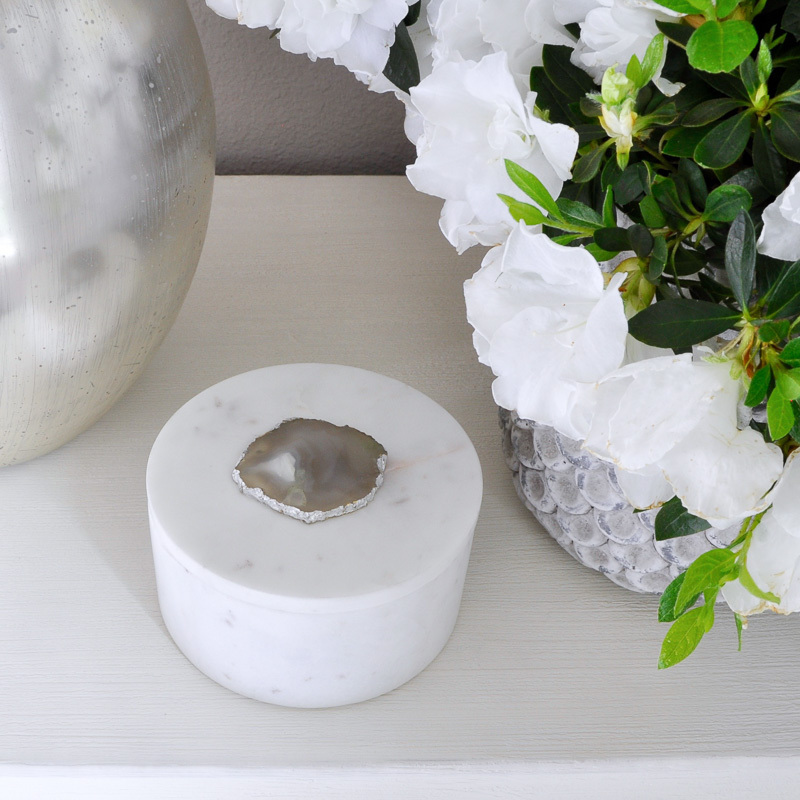 A second marble box with agate on the lid was perfect for the nightstand. 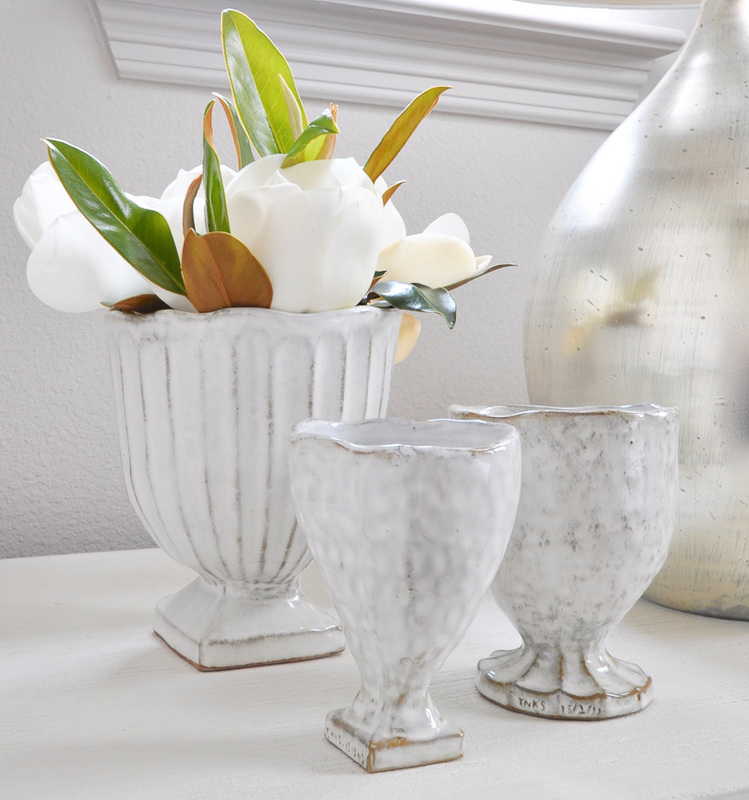 I also fell in love with this trio of vases. Every room deserves a scented candle and I knew I wanted a bit more gold in the room, so this beauty is just right. The lamps were an early selection and I am elated as to how they work in this space. 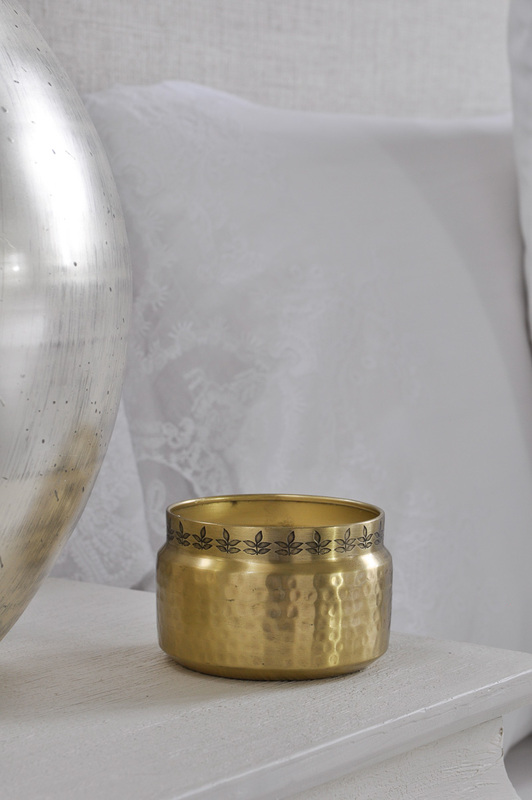 This trendy Round Gold Mirror is the perfect compliment to the table between the chairs. 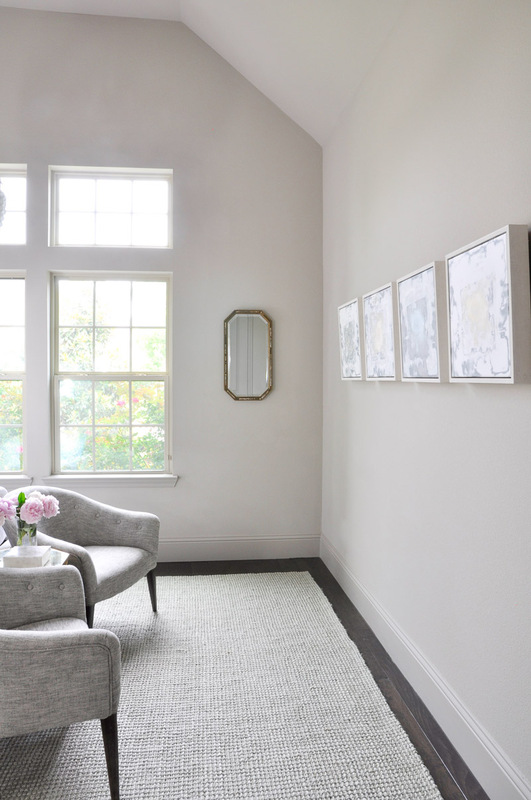 It also reflects the vintage mirror next to the windows which helps bounce the light around in the room. 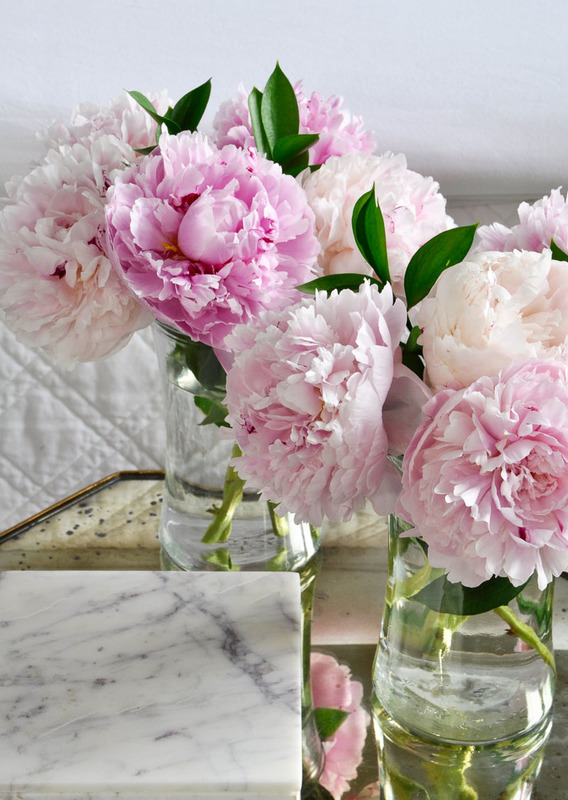 Last, a big thanks to FTD for the gorgeous peonies! Thank you so much for visiting Decor Gold Designs! Sources below. You can find all of the room reveals on Calling It Home. A special thank you to my amazing sponsors! And there you have it. I sincerely hope you have enjoyed the weekly sneak peeks into my second One Room Challenge. Hopefully you will feel inspired to make-over a room in your own home. To tour the rest of my home, click here. If you would like to receive email updates, please consider signing up for my newsletter. You can also follow along on Instagram, Pinterest, and Facebook. well. done, jen!! everything is absolutely gorgeous. I especially love the chandelier and luxurious bedding you chose. your guests will be so blessed! love it all! Stunning room Truely inspirational. Please can you tell me the name of the colour used to paint the walls? Thank you Aisha! It’s a light taupe color, but it is a custom blend. Sorry! oh mine! is this what sleep in the sea of cloud like? it is so elegant and luxurious! My favorite has got to be your chandelier … oh wait maybe the side tables too! Bravo and congrats on Week 6 of One Room Challenge! Thanks so much Tim! What a pleasure and a relief to have it done! I appreciate your kind words. I’m loving the chandelier and side table too. I’m excited to see your fabulous dining room! Oh I bet! I must get to High Point. I can only imagine how amazing it must be and your favorites are two of my favorites too! Thanks so much for stopping by and for your kind words! such a light and bright pretty space! i love the two chairs so much- they add a great modern touch. Oh wow! A pretty white space! Just how I like it! The room looks welcoming and calm! Thanks so much Jordana….that is exactly what I wanted! Those chairs are everything! I’m obsessed. And your bed is styled perfectly, it looks like it’s straight out of a magazine. Amazing job! Wow!!! Thank you Bre! I am truly flattered by your words. So so kind of you! Jen, your bedrooms have the most romantic vibe! Love all of your choices, especially the nightstands and chairs! Your guests are so lucky to have this GORGEOUS bedroom to retreat to. Well done friend! Jennifer, this is absolutely beautiful! Many of your brands are my fave brands too! That Currey & Co. fixture is stunning! The room is so calming and luxurious. Your guests will never want to leave! I love it! They really are great brands and I’m thrilled to be able to feature them. Thank you so much and thanks for visiting my reveal! Thanks sweet friend! I wish you could see the layers in person. I love them! The little Aidan Gray table was such a fun find and I’m so happy with the nightstands too. Thank you again! You’ll have to participate next time! Wow, what a soothing and beautiful space! I’ve loved that chandelier since you first shared it, and it really does fit the space perfectly. Great job! Your room is so crisp and bright!!! You did an amazing job as always, you are so talented, I am truly in love with those fantastic pillow shams the touch of gold such an unexpected treat for my eyes on the all white bed. Bravo!!! Thank you so much Jennifer! I loved the gold details from the first moment I saw them. They look so dimensional in person! Thanks so much for your visits and encouragement. I hope your first ORC was fun! Thank you so much Bree! I knew you would love the chairs! I love them too and I’m thrilled that I am able to feature them in my reveal and in my home. Your support and encouragement has been much appreciated! It’s all so pretty and serene Jen and again you outdid yourself with this design! I know that your guests will feel so special! Oh Janet! You are so sweet! Thank you so much my friend! Gorgeous! So serene. Like a chic hotel. That chandelier is everything. So well done and the pictures are stunning. Thanks Erin! I love the chandelier too……the beads are so fabulous in person! And thank you so much for your comment about my pictures. I had gray skies the two days I shot the room which is a huge challenge for me! The room looks so pretty.I love the chandelier and the rug. Thank you Nina! It’s called Tobago or Naturals Tobago. NAT – 19 Jaipur Living’s code for it. You will love it even more in person…it is so pretty! Seriously gorgeous! I can’t imagine a more perfect way to make your guests feel at home. 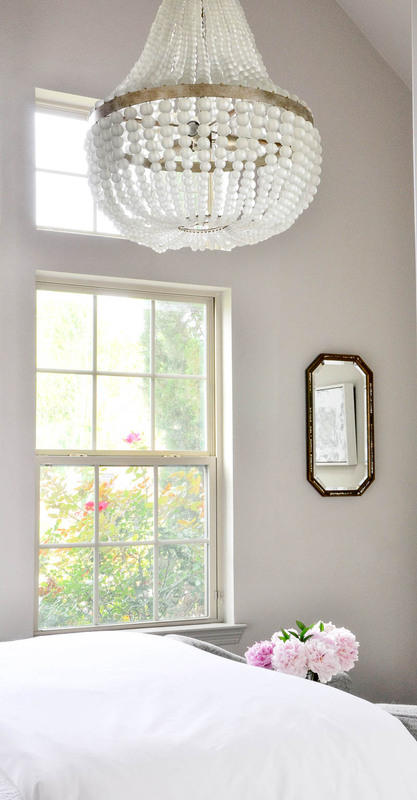 It’s so bright and airy, and I love that chandelier and the dressers SO MUCH… but I actually think the chairs ended up being my very favorite. I just love their shape and lines! Wonderful work!! Thank you Angela!!! The chandelier and dressers are definite favorites and the chairs….. I can’t properly describe how much I love them. Glad we make it through this challenge together! I’ll have one of everything please! 🙂 No seriously, every single piece in your room is exquisite! 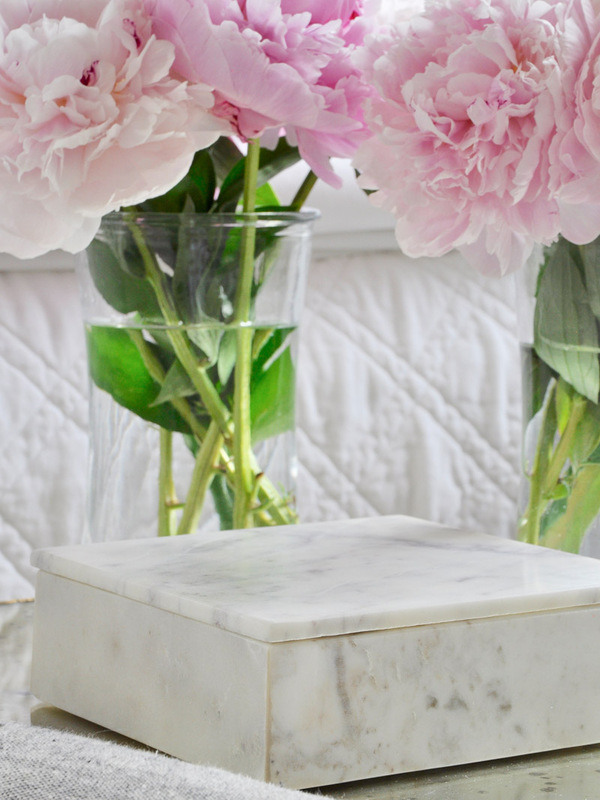 My favorites have to be that chandy and the nightstand – love those so much! Not sure what I’d do if I got to your house and was given the choice of guest rooms – you’ve got two stunners now! So well done my sweet friend – congrats!!!! Thank you Kris!!! It’s so nice to finally have two finished guest rooms! Stunning. Your guests will never want to leave. It is so serene, calm and stylish. That Currey chandy is everything! Wondering…did you address the windows (no privacy treatment) in an earlier post that I missed? Congratulations! Your taste is impeccable. Hi Beth! Thank you! Good question about the windows. They are not a standard size and I will most likely need to have custom treatments made. I was a little behind getting started on this challenge, so I ran out of time. Luckily, our rose bushes cover most of the windows and no one has stayed in the room yet. I will definitely need to address this soon. So beautiful, elegant and serene! My favorite so far!!! Curious about your rug, is it a silver gray and off white in color? Thank you so much and sorry for the delayed response! It is definitely just a silver gray. Hope this helps! Absolutely beautiful. I love your use of neutrals!!! So subtle and layered. I need to go back and look at earlier updates to see the progress, I want to get a closer look at the ART! Congrats on a job well done. I am doing a “favorites” post and this will definitely be in it!!! Thank you Leslie! I just saw your post and loved it! There were several bedrooms included that I had not yet seen. Love them all! This turned out so beautifully! I am in love with every detail. Your home is a true inspiration! Jen, I can’t pick a favorite part. I just can’t. The chandelier? The chairs? The lamps? Maybe the nightstands? Fantastic job – your guests are going to be in Heaven! Have you started thinking about fall? Thanks so much Brittany! I’m thrilled to have it done! Thank you Tana! Come stay with me! You don’t mention the source for the bed or did I miss it? Wow, what a gorgeous room. The chandelier is just stunning. Would you mind sharing the name and brand of the wall color, it is gorgeous. Beautiful room! I love your chandelier the best and would purchase it if my ceilings were higher. Those night tables are my second favourite thing. Well, everything is gorgeous! While the chairs look nice at the foot of the bed, facing the wall seems awkward. The view from the chairs would be better (imho) if they were placed under the pictures, looking towards the beautifully made bed and interesting night tables. Thoughts? I absolutely love the room! The chand liver is stunning with those beads. I like it so much better than similar with wood beads. My question is, did you put the chairs up to the foot of the bed for picture taking purposes or do you intend to leave them looking at that wall? I just thought if they were backed up to the wall they could appreciate the beautiful room you created. Please don’t take this as negative I truly am trying to learn, and if there is another reason for your positioning the room the way you did I’d like to hear/read it. Love every single detail, especially the good table and little gold accents you sprinkled throughout the room. Just the perfect touch! Great job as always Jen! yep, I don’t think I would ever leave my bed if this was my room 🙂 What a beautiful ORC makeover, you did a lovely job, and I’m loving that chandelier! Absolutely love every detail of this room! The chandelier you ended up with is gorgeous. Any chance you know the name of the one that you pinned in your inspiration board? It looks slightly different and might work a bit better for my space 🙂 thank you!! This is such a beautiful and inspirational room! I’m planning on using these nightstands in my bedroom but am struggling with coordinating a (desperately needed) dresser. 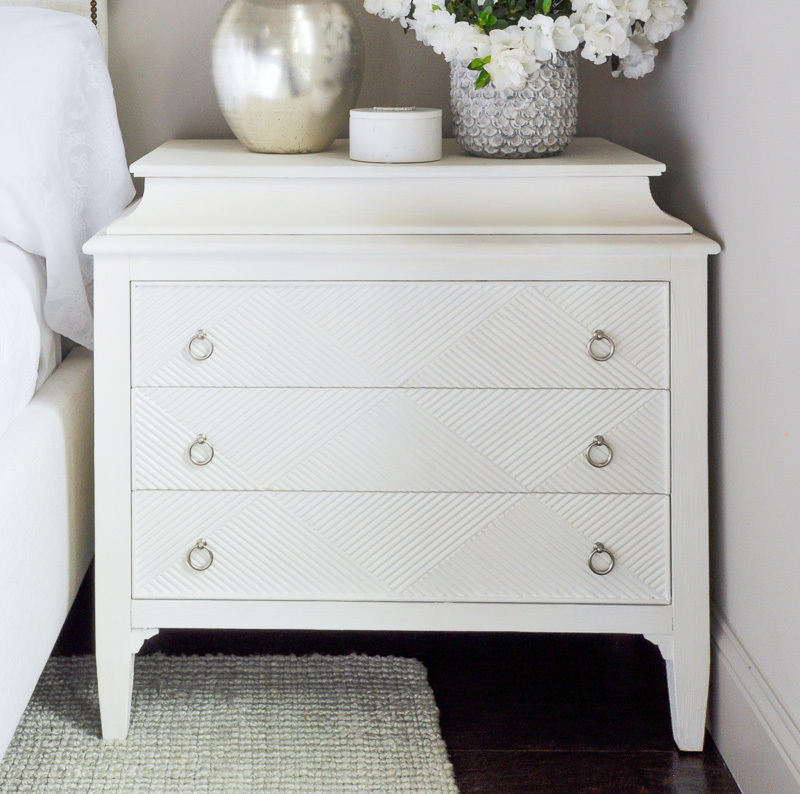 Do you have any suggestions for a dresser that would pair well with those nightstands? Good luck with your decorating project!